Cotton Bales, Goatmen & Witches: Legends from the Heart of Texas made its holiday debut Nov. 22 at book retailers everywhere. Author Bradley T. Turner and Photographer Mark Burdine provide a compilation of chilling tales and legends about the Waco, Texas, area, all in a large hardback coffee table book. How did a famous Victorian poet’s ghost come to inhabit a university library in Central Texas? Why do artifacts from Bonnie and Clyde’s “death car” still move at a museum named for the famous early Texas lawmakers? Why is a ghost still searching for his arm in the downtown Waco area? Was a gambler really entombed sitting at a poker table with aces hidden up his sleeve? 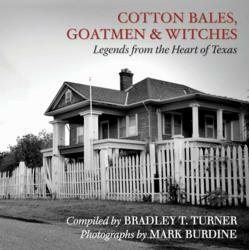 Author Bradley Turner collected the tales and photographer Mark Burdine shot high-quality black and white photos of the present-day locations to make this beautiful 11x11-inch coffee table hardcover book, Cotton Bales, Goatmen & Witches: Legends from the Heart of Texas that made its holiday debut Nov. 22 at book retailers everywhere. “The most important aspect of the legends is not the events, places, or people described in the tales, but the stories themselves,” said Turner, who also wrote and compiled stories for his first book, Lust, Violence, Religion: Life in Historic Waco. Turner compiled the tales after hearing stories all his life. “These are tales we don’t want to get lost,” said Turner. Already there are variations of the spooky tales that illuminate the darkest recesses of the Texas psyche from the distant past to the present day. Getting them together in one book preserves them for generations to come. The book retails for $34.95 and is available at major book retailers such as Amazon and Barnes & Noble. TSTC Publishing, established in 2004, is the publishing arm of the Texas State Technical College System, TSTC Publishing offers faculty throughout the country the opportunity to initiate and participate in a variety of book development projects. TSTC Publishing projects now include such ancillary products as instructor guides, student workbooks, CD-ROMs, DVDs, ebooks and companion websites. In addition to offering editorial help and guidance to faculty, assistance also is available in the areas of materials production, distribution and sales. "The Gambler's Crypt" as it stands today near I-35 in Waco.